Home / gardens to visit / Longstock Nursery, the home of Buddleja! Longstock Nursery, the home of Buddleja! Well ok it’s not really their place of origin but Longstock Park Nursery is the home of The Plant Heritage National collection of Buddlejas. The Plant Heritage National Collections are really of great importance, these collections are of national importance, they hold forms of plants that otherwise would be lost to cultivation, these holders do their best to not only find all the forms of a certain plant but also to propogate them and make them available to others, again spreading the plants around the country and saving them from being lost to cultivation. Longstock park nursery (part of the Leckford estate, ran by Waitrose) is lucky enough to have 2 national collections at its mid Hampshire home, set in the old walled garden and its outskirts deep in the Test Valley. The first one being Clematis vitacella and the second, Buddleja species and hybrids forms of which they currently have 40 Species and 70 Hybrids (I never knew there was so many!) growing in large beds oppersite the long herbaceous borders, near the tennis court and spread around the park. These beds also contain a few of the hybrids they have bred onsite via their plant breeder and propagator exstrodinaire, Peter Moore. Buddleja aren’t the only plants he has bred some fine examples of plants including Choisya ‘Aztec Pearl’, Goldfinger, Aucuba ‘Golden Girl’ are just some of his delights. Cultivation advice is freely available as well as a huge range of them for sale. Out of interest Buddleja itself was named of the British amateur Reverend Adam Buddleja by Von Linne in 1737. I visited during the The Butterfly Count (sponsored by Waitrose) and they openly invited visitors to the nursery to take part, with ID charts and pencils readily supplied. I think I managed to count about 65 butterflies during my count. It was wonderful seeing them flying on all the different colours, size flowers and indeed size of plants that grow within the collection. Buddleja nivea var yunnanensis. Never thought of Buddleja as a foliage plant until I saw this one! No idea on the flower but worth growing for the leaves alone. Discovered by Ernest ‘Chinese’ Wilson in its endemic area of China, Yunnan. It is thought by some just to be nivea but not by Wilson and that’s good enough for me! Buddleja lindleyanna. A medium sized plant with striking long curved racemes of this beautiful colour. This refined form was discovered by another famous plant hunter Robert Fortune in 1843 from China. Buddleja ‘Morning Mist’ or Silver Anniversary as it is sometimes called, is indeed one of Peter Moores Longstock Park hybrids. It’s certainly a long flowering form, in one of my gardens, it was still flowering in April this year, nonstop since June! It is a compact plant with a lovely honey scented sterile flowers, borne over some great foliage. Well worth growing in any garden! 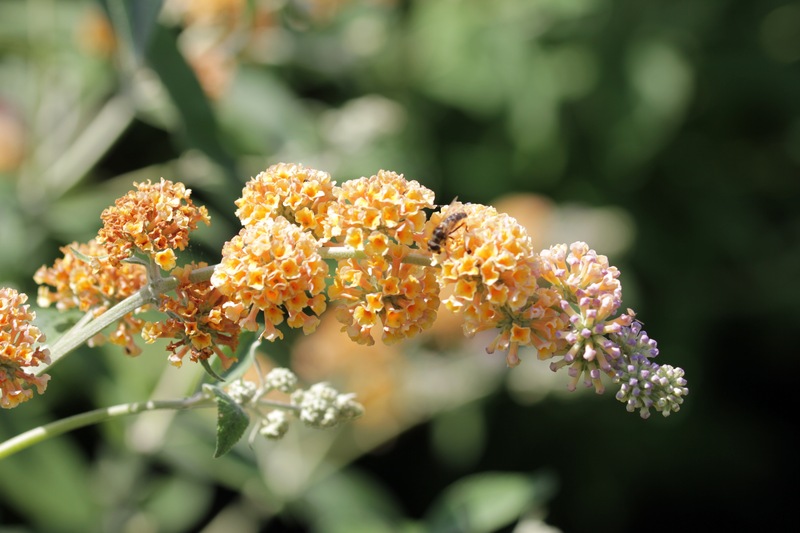 Buddleja davidii ‘Marbled White’ is a beautiful white form, with a orange-yellow centre, borne on a upright plant, has a great honey smell to the flowers as well! One of the highlights for me, after seeing so many beautiful plants is being able to buy one of them, at Longstock, it was added bonus to get what I wanted. They had so many for sale, it was wonderful to see. I really enjoyed my visit to the nursery and if you fancy a visit it can be found just north of Stockbridge in the amazing Test Valley. Postcode is SO20 6EH. It’s open Monday to Saturday 9am-5.30pm and Sunday 10am-4pm. There’s no charge to see the collection but they do rather tempt you both with a great tearoom, farm shop and top quality plants.